From understanding the big-picture search trends to making sure your SEO goals jive with your CEO’s goals, there’s a lot to consider when planning for 2017. 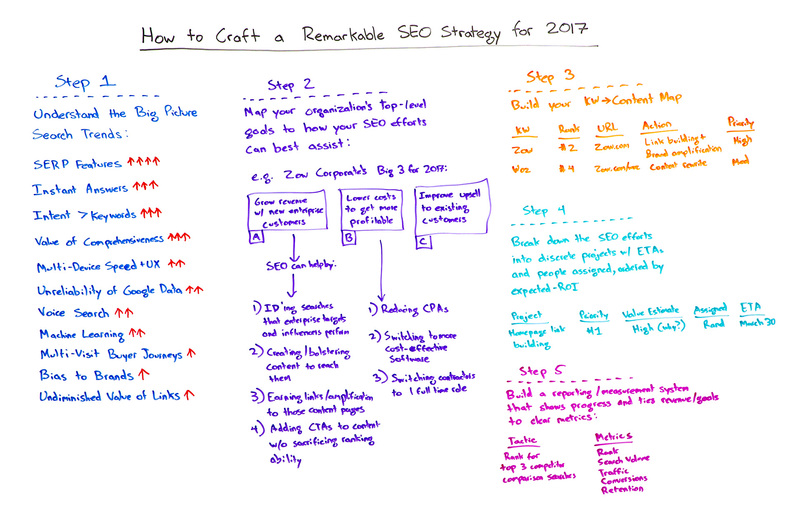 Next year promises to be huge for our industry, and in today’s Whiteboard Friday, Rand outlines how to craft a truly remarkable SEO strategy to help you sail through 2017. Howdy, Moz fans, and welcome to this special New Year’s edition of Whiteboard Friday. I hope you have all had a wonderful holiday season and are about to have a wonderful New Year’s. This week, we’re going to chat about how you can have a remarkable, amazing SEO strategy in 2017. The first thing I’m actually going to start with is not the broad-spectrum, strategic picture, which we talked a little bit here on Whiteboard Friday about, and I’ll reference some of those, but is actually understanding some of those big-picture search trends. What are the search engines doing? How is that affecting my strategy? How does that mean I should influence and affect my specific tactics for 2017? So I’ll walk through a few of these big ones. There are others, but I think these encapsulate many of the big things we’ve been seeing. A huge rise in SERP features, meaning that Google is showing many more types of data and types of markup in the search results. We have, I believe, 17 that we record for Keyword Explorer, but there are another 7 or 8 that we do not record, but that we see in between 1% and 2% of queries. So there’s just a ton of different features that are going in there. A rise in instant answers. This is especially true on mobile, but it’s true on desktop as well. Google is trying to answer a lot of the queries themselves, and that can mean they’re taking away traffic from you, or it can mean there’s opportunity to get into those features or those answers. Intent > keywords: We’re also seeing this trend that started with Hummingbird and now, obviously, continued with RankBrain around intent, searcher intent being more important than keywords in how we target our content. This does not mean you can remove keywords from the equation. You have to understand what the searcher has typed into the engine before you can serve their intent, and very small variations in keyword structure can mean real changes in searcher intent. That’s a critical part of how we craft content for people. The value of comprehensiveness has clearly been on the rise. That’s been true for a couple of years, but it definitely is a trend that continued in 2016 and we expect to continue into 2017. You can see a bunch of examples of research in that area, including some from Whiteboard Friday itself. Multi-device speed and user experience, Google’s been harping on this for several years now, and I think what we are observing is that speed is not the only user experience element. Google has taken action against overlays and pop-ups. They’ve taken action, clearly, that suggests that there are some engagement metrics that are going on there, and that sites that have better user experience and that garner better engagement are doing better in the search results. We’ve seen a bunch of trends around unreliability of Google data. That includes search volume data. It includes data in AdWords, around Google showing you which keywords are in there. It includes inaccuracies in Google Search Console, formerly Webmaster Tools, around rankings. My colleague, Russ Jones, has just put out a big piece on that showing, essentially, that if Google says you got this many impressions and this many clicks, that may be totally wrong and false, so be cautious around that. Voice search, clearly on the rise. Not yet a huge trend in terms of an addressable market that search marketers can go after, but we’ve talked a few ways here on Whiteboard Friday and at Moz about how you can think about voice search impacting your results in the future and what types of content you might want to produce to be in front of voice searchers. Machine learning and deep learning, Google has clearly made a shift to that in the last 18 months, and we’re seeing it affect the search results in terms of how they’re considering links, how they’re looking at keyword searches, and how they’re looking at content. Multi-visit buyer journeys have always been important, but I think we are now seeing the trend to where not just search marketers but marketers of all stripes recognize this, and a lot of us are optimizing for it, which means that the competitive landscape now demands that you optimize for a multi-visit buyer journey, that you don’t just consider a single visit in your conversion path or in your optimization path, and that means, for SEOs, considering what are all the queries someone might perform as they come to and come back to my site. Bias to brands, that is a continuing trend over the last few years. We’re still seeing it, and we’re seeing it even more so. I would say we’re seeing it even when those brands have not necessarily earned tons of links, which used to be the big dominating factor in the world of is a brand stronger than a non-brand. A lot of times that was about links. Now it seems that those are decoupled. That being said, we’re kind of feeling an undiminished value of links. If you’ve built a brand, if you’ve done a lot of these things successfully, links are certainly how you can stand out in the search results. That’s pretty much as true in 2016 and ’17 as it was in 2011 and 2012. Only caveat there is that the quality of links matters a lot more. So, knowing all those things, I think we can now craft some very smart SEO tactics. We can apply those to the SEO problems we face. Step two is to map your organization’s top-level goals to your SEO tactics, and that can look something like this. Here’s Zow Corporate, the opposite of Moz, which is hopefully not very corporate. Zow Corporate’s big three for 2017, they want to grow revenue with new enterprise customers, they want to lower their costs to get more profitable, and they want to improve their upsell to existing customers. So SEO can help with these things by — and this is a really smart framework — you want to take the things that your organization wants to accomplish at its executive or board level, and you want to show that SEO is actually doing those things, not just that you’re trying to rank for keywords or bring more traffic, but that you’ve mapped your priorities in this way. So I could say SEO can help by identifying searchers that enterprise targets and influencers perform and then ranking for those. We can lower our costs to get more profitable by reducing the cost per acquisition. We’ll drive more traffic with organic search, thus reducing our dependency on advertising and other forms of marketing that cost a lot more. Those types of things. Step three is to build a keyword to content map. We talked about this here on Whiteboard Friday. I’d urge you to check that out if you haven’t already. But the basic concept is to have a list of terms and phrases that come out of your tactics and your goals, that you build a map for and then show like, “All right, here’s how we’re ranking today. Here’s the URL which we’re ranking with,” or, “We don’t yet have a URL that’s targeting this keyword phrase, and thus, we need to build it,” and then the action required there and what the priority is. You can also think about adding some additional things to your content-to-keyword map or to your project list by breaking down all the SEO efforts that you’re going to do to hit all these goals into discrete projects with a few things — an estimated time of delivery, the people who are assigned to it, and an ordering based on the expected return on investment. You can be wrong about this. It’s okay to be, “Hey, we’re taking our best guess, thumb in the air. We don’t really know for sure, but we’re going to try. Here’s the project. It’s link building for the home page. It’s our number-one priority. The value estimate is high because we currently rank number two or three for our own brand name. It’s assigned to this person, to Rand, and the ETA is March 30th.” Great, terrific, and now I know. I’ve taken this from here and from my projects list. It’s part of my goals. It’s where I think I can have a big impact. Terrific. So you want to take any tactic or any project and add the metrics by which you will measure yourself. So if we’re trying to rank in the top three for our competitor comparison searches, Zow versus whatever companies Zow’s competing with, and the metrics there are ranking first, then search volume, the traffic we get from it, the conversions, and the retention of those customers who’ve come through, now you’ve got a real picture of how your SEO efforts map up to these big-picture goals. It’s a great way to frame your SEO. So, with that being said, I am looking very much forward to hearing how you’re planning your 2017 SEO strategy. If you have recommendations and tips that you’d like to see here or questions, feel free to leave them in there, and despite the holiday break, I will be in there to answer your questions as best I can. Look forward to joining you again next week and next year for a wonderful year of SEO and Whiteboard Fridays. Take care.